Stephanie's on Newbury has become an institution in Boston. Located in the heart of one of Boston's most historic streets and upscale shopping districts, Stephanie's has been serving "Sophisticated Comfort Food" in a relaxed, inviting atmosphere since 1994. Locals, travelers and shoppers alike favor this classic American bistro because of its commitment to blending old fashioned American favorites with a current, fresh twist. 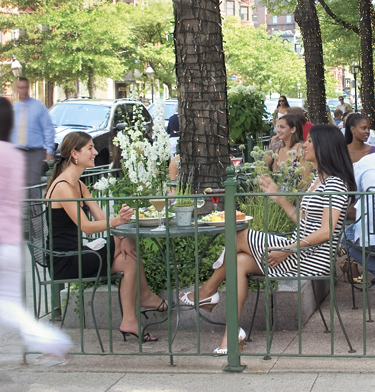 Stephanie's is casual elegance at its best with one of the city's most fashionable sidewalk cafes, popular club-like bar and cozy skylit dining spaces. "It's a sophisticated and elegant place, that is perfect for lunch on a bright day or a late evening romantic dinner." "The city's premiere upscale comfort-food eatery." "Stephanie Sidell serves sophisticated American cooking, big salads, grilled fish and chicken."